There's something special about The Who... The quartet was one of the few musical heroes of my puberty that didn't loose the grip later on. Quadrophenia was my favourite Who album. Filled with strong songs and a story of teenage frustration that was easier to relate to than Tommy. I've had several revivals of The Who in general and Quadrophenia in particular during the following years, in connection with the film (meaning Quadrophenia not Tommy), a splendid Quadrophenia tour in 1997 (with P.J. Proby and Billy Idol among the guest artists), great remasters of old albums and when it's been a while since last I heard any Who music. Listening to one album often lead to the next (not only Who's Next). Endless Wire is the first studio Who album since It's Hard in 1982. Roger and Pete have to some extent taken the consequences of being the only two surviving members of the band. There are several tracks held in an almost folk or singer songwriter tradition. Guitar, mandolin or piano and vocals. To underline the importance of the lyrics of those songs, maybe. Insteresting stuff but Roger's coarse affected voice in "In The Ether" doesn't sound very credible to me. It would've been a perfect song for Tom Waits, though. Well, the majority of songs on the album is fully orchestrated rock, some with the current Who tour band, quite a few guest musicians, but mostly played by Pete Townshend himself it seems, even drums. Unfortunately Zak Starkey (yes, the son of Ringo "Practise? I never practise. Drumming is easy!" Starr) only appears on one of the songs, being ocupied with Oasis commitments during the recording of Endless Wire. His drumming is the best substitute for Keith Moon's (I suspect he has been practising). "Fragments" and "Black Widow's Eyes" give some reverberations of Quadrophenia, though cannot quite match that standard, I suspect. The former even includes a synthesizer loop similar to the one that starts "Baba O'Riley" and Who's Next, only quicker. The lyrics of the album deal with relationships, music... Also, organized religion and religious leaders are among those that are to blame: 'You are all the same, Gilded and absurd, Regal, fast to blame, Rulers of lost word, Men above men, or prats, With your tall hats' (from "A Man In A Purple Dress"). The album is divided into two, first about half an hour of ordinary songs, followed by the 21 minutes mini-opera Wire & Glass. The latter mainly includes short songs, less than two and a half minutes long. Some might say they're only sketches or early versions of songs. I think it's the most interesting part of the album. It's directly based on Pete's novel The Boy Who Heard Music available on his home page. It demonstrates Pete still has a lot of interesting ideas up his sleeve with music pointing in several directions, more so than the first half of the album. Rock, roots, almost country, classical strings and the strange "Tea & Theatre" beyond any easy genres. Still one might regret that "Pick Up The Peace" and "We Got A Hit" weren't developed into full blown Who classics in the same manner as "Fragments On Fragments" was turned into "Fragments". My Deluxe version of the album includes a bonus disc of The Who Live At Lyon last summer (not Live At Leeds this time). 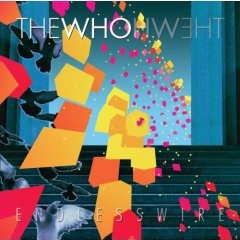 It's part of the Encore Series of live recordings on CD and DVD of The Who's 2006 tour available from www.themusic.com where all profits go to charities supported by the band. It includes seven songs, a couple of obvious classics ("Won't Get Fooled Again" and "Who Are You"), a couple less so ("The Seeker" and ""Relay"), one in between ("Naked Eye"), one off the new album ("Mike Post Theme") and one unknown to me ("Greyhound Girl"). It confirms that The Who is still well worth checking out as a live outfit. All in all Endless Wire seems to be the most interesting release of new material from The Who camp since Pete Townshend's classic solo album All The Best Cowboys Have Chinese Eyes way back in 1982. File under old heroes who still have something to say. You may also want to check out our Who articles/reviews: I Can't Explain, My Generation, Quadrophenia - Different Deluxe versions, Who's Next.